Bake dog-themed cupcakes and sell them to friends, family, or colleagues. We’ll even give you the recipe. Make an autumnal walk more memorable – invite others along. Pick a landmark and go there together. 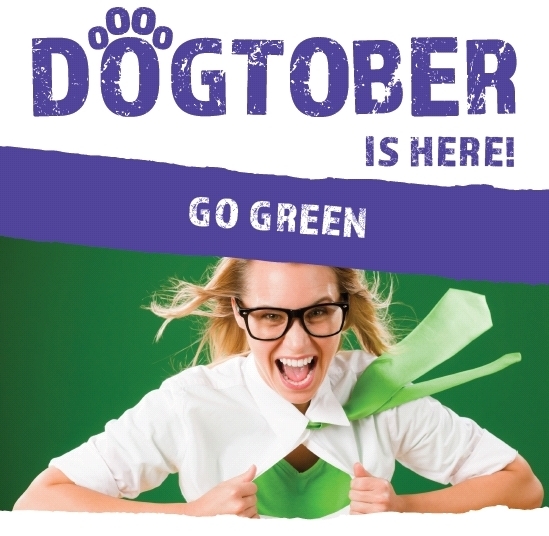 Fill your home, office, or school with green balloons, wear a green tie, or dye your hair green. Go wild! Where’s the wackiest place you can wear your wellies? At work, in the pub, playing rugby? Surprise us! Warm up your sports practice with a hot dog stand, or get club members together for a tasty treat indoors. As if you need an excuse for coffee, cake, and a chinwag… choose any of the 31 days in October. Our six events are only suggestions. You can do whatever you like to support Dogtober. Every penny will count since we receive no government funding and rely solely on donations. By posting to our social media channels, you give us permission to re-share your images publically in our own feed. If you’d rather not share your images openly, email them instead.